Here's a collage of the progression as well as some individual and composite exposures during totality. All shots taken with my Nikon D7000 (full spectrum modded) and Astrotech AT65EDQ on a Sirius EQ-G mount. 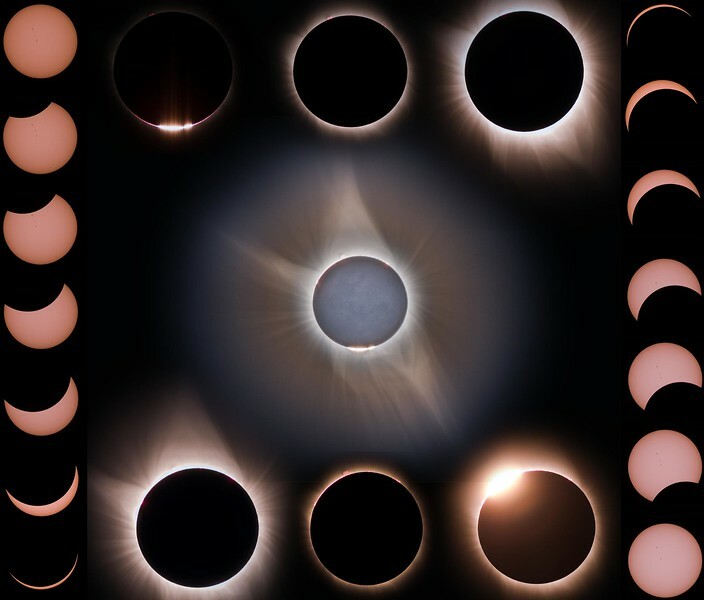 The progression exposures were 1/4000 shots, the totality exposures ranged from 1/4000 up to 3 seconds and include the corona, solar prominences, diamond ring, a bit of Bailey's Beads, and earths shine. The composite and collage was created in Photoshop....using a ton of layers. Shot from just outside Stanley, Idaho.